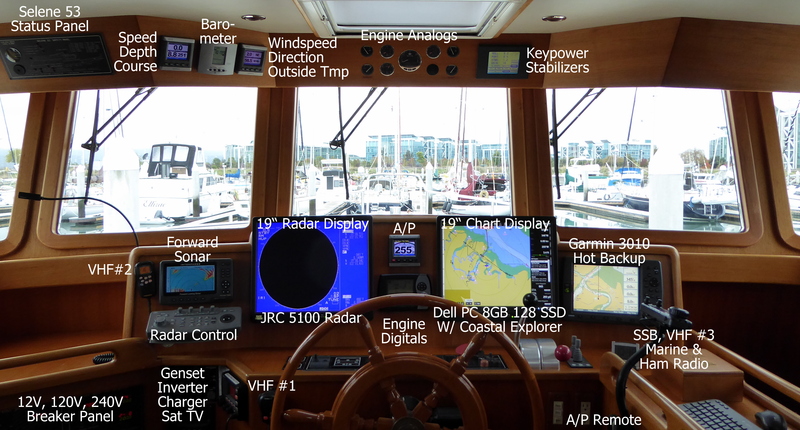 The Harbormasters office opened up early for us, this so we could get underway along with the ebb to Pier 40's South Beach Marina. While our moorage payment was being processed, Alex noticed a prominently displayed magazine with a great photo of Wild Blue. 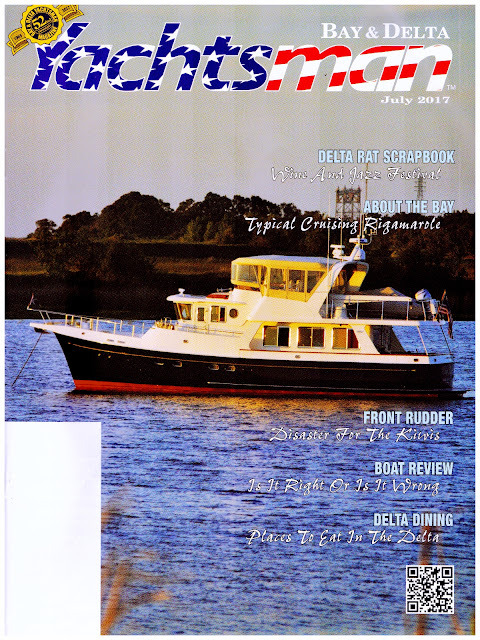 Yachtsman Magazine July 2017 cover photo was from our April cruise to the Delta. We had anchored south of Decker Island, off the main Sacramento River ship channel in "Horseshoe Bend". Apparently a shore based photographer submitted his work and the astute crew at Yachting Magazine picked it up for the July issue. Alex flew from Sitka to San Francisco yesterday with a box full of fresh caught Alaskan King salmon. Turkey rancher Willie picked him up at SFO and they joined chicken rancher Joe and CPA Mike aboard Wild Blue in Westpoint Harbor, who were already enjoying refreshments. Back in the late 1960's, these boys, actually now mature men, along with Alex "Learned by Doing" at Cal Poly San Luis Obispo. Each year they return for an Alaskan fishing cruise. Last year their fishing exploits were considered "so noteworthy", Sea Magazine republished the Wild Blue Blog. You can review that here. 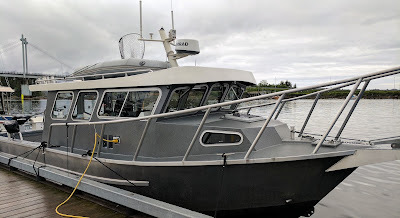 After viewing the favorable marine weather forecast, we decide to begin our fishing cruise outside the Bay in the ocean for the first few days. The fishing reports seem to suggest Half Moon Bay's Pillar Point Marina as a good base for ocean salmon fishing. By 10:45 we are on our way north, bucking the last of the flood tide towards the Golden Gate. We time it just right, crossing under the great bridge just as the tide turns to slack, and we turn the boat southward. The ocean is quite nice: light wind, a soft, low swell nicely spaced, and no wind waves. Sea birds, whales and brownish water set a fine stage for salmon fishing. Even the fish finder displays large bait balls most typical at slack water. By 4:30 we are off the Pillar Point Air Force Station and about ready to enter Pillar Point Marina. Bait shows up on the fish finder. Pillar Point Air Force Station is currently used for missile tracking. That evening Chef Willie, of WillieBird Restaurants, created a gourmet feast of bay shrimp salad, garlic prawns, and egg flower soup. three main course dining experience. potstickers was the main course! Well it had to be pretending, otherwise how could you explain it? For two and one-half days we saw all signs of excellent fishing conditions. Favorable tides, water, weather, bait, birds, and whales all pointed to a full fish box. We dragged lines daily for many hours...... nothing happened. Of the 20 or 30 sport-fishers we watched closely, not a one boated a fish. We rechecked depth, bait, lure, troll speed, and even made sure there were no bananas aboard! The fish were no where to be found. Now we call that pretending to fish, but also....... that's fishing. Monday was our last good outside weather day but by noon with still no joy, we stowed the rods, and headed through the Gate and up to the Delta. At 6-ish, we pulled into Delta Marina at Rio Vista located on the Sacramento River. Of course Rio Vista has the world famous Fosters Big Horn Cafe, a game hunters paradise, and Willie, Joe and Mike are game hunters. Willie had a friendly chauffeur deliver us to the Cafe. CAUTION: This is a boring video with excellent music. of the Golden Gate is the fog horn building. comedian and politician make us laugh hysterically at times. Fort Baker was another coastal defense fort. East Brother Light with a nice B&B. I always thought C&H was "Pure Cane Sugar From Hawaii". The US Navy mothball fleet at Suisun Bay. Kite boards and wind generators have a need for big breeze. from old to new technology. even cut the salmon pieces to look like a small fish. Yum! After last evening's big game dining experience, we're leaving Rio Vista for the Willow Berm Marina, just off the San Joaquin River. To get there we follow the 3-Mile Slough. To get into the Sough, we need the Three-Mile Slough Bridge lifted. At the end of the Slough, this route requires us to turn left at the San Joaquin River, following along as it meanders eastward, then turn left at the Mokelumne River and following the "M" River to the Willow Berm Marina. After securing the boat, we hike the 1/2 mile to the entrance, pay our moorage fees, then enjoy several brews at a VERY local pub. Tomorrow we'll exit at 9:30 timing our route to ride the ebb current back to San Francisco at South Beach Marina. large ship appearing to pass through the farmlands. Herons enjoy the Delta life. The crew is spoiled. No fish, hot weather and the cruise is almost over. We glide into the South Beach Marina, San Francisco. Instead of a SF Giants game, we decide to entertain Joe's daughter at Tadich Grill, a Frisco favorite. The cruise finishes with another superb epicurean experience. It's always a blast with the CP Boys. 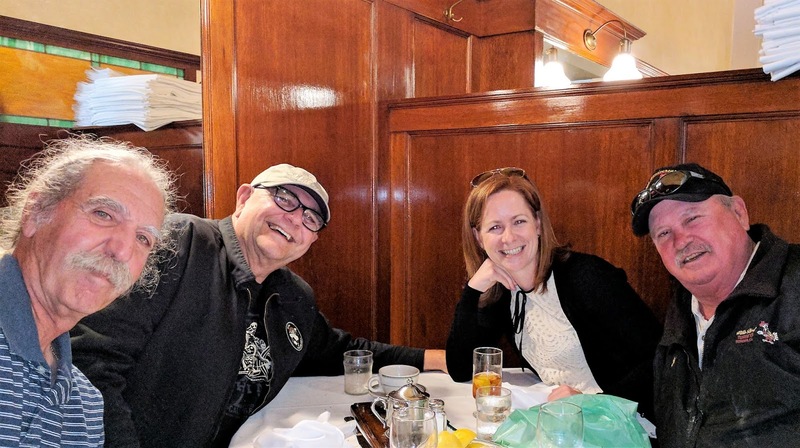 Each year we relive our college days, embellish and repeat the same stories, and wonder what happened with our other college friends. We are the lucky ones and look forward to reliving the good times next time we crew together, which looks to be La Paz Mexico this winter. Northern California's oldest (and Alex's favorite) restaurant Tadich Grill. This summer the Wild Blue is cruising San Francisco Bay and the California Delta, but when asked to crew in Alaska, how can we say no? The past several days Alex has been on Miss Micky, a new North River 33. Crewing with owner Captain Jay Field, Alex helped route Miss Micky from Craig-Alaska through El Capitan Pass, Rocky Pass and Peril Strait to Sitka. All went well even with an engine shutdown in Rocky Pass. At low tides, portions of the Pass get congested with bull kelp, so much so an engine raw water strainer filled with kelp. After a quick clean out, the engines were back online and again cruising at high speed. This fast aluminum sport fisher cruises at 24 knots, three times Wild Blue's cruise speed. 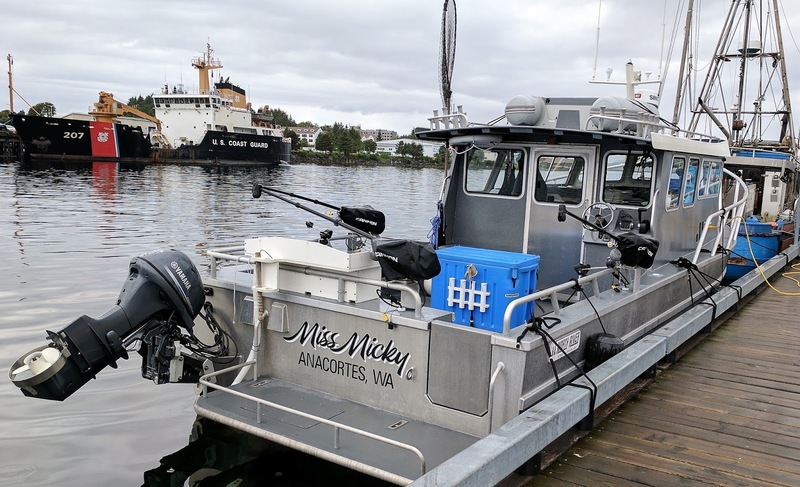 A 3-day cruise on Wild Blue became a 11-hour motor on Miss Micky. It was a fast and fun ride into Sitka Sound. Miss Micky: Looks fast even when tied to the dock! Once in town, we spent the next three days mapping out the nearby fishing spots identified by Wild Blue on previous fishing exploits. 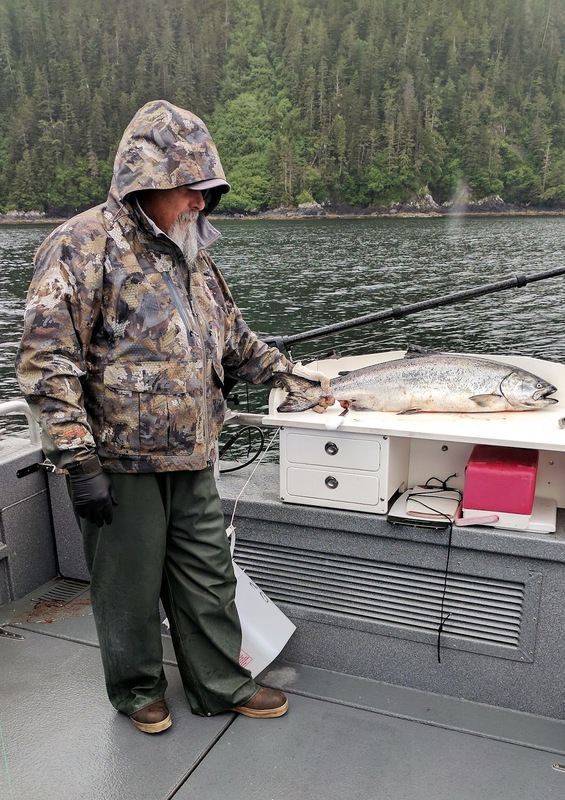 Here is the complete list of Wild Blue's Southeast Alaska Fishing Spots. On Saturday, a normal 5-hour trip on Wild Blue to Whale Bay was shortened to 90 minutes. The new boat's chirp sonar, with an experienced operator, can mark salmon at depth, a huge assist when adjusting trolling gear. We checked out the Bay, then moved back up north to Biorka Island. In three hours trolling, we "sore-mouthed" nine king salmon, keeping one for Alex's license. On Sunday, the Sitka sun shined in cloudless, bright skies. The Sound was near flat and winds light so Jay steered Miss Micky just outside Cape Edgecomb. There the guided sports-fishers were clustered close together. We again hooked several keeper kings, and kept a 33-inch, 15 pound fish for Alex. We ended the day on a double-hookup, sore-mouthing both for a future angler. On Monday the forecast was for 25 knot southerlies with 8-foot seas. We headed North to Salisbury Sound. There we fished the Shark Hole and the waters off Point Kruzof. Discounting the rockfish, it was a "no bite" day up until we trolled the Shark Hole's inner wall. Up close with the kelp in 70 feet, a King finally bit in 44 feet. It was a good 19-lb keeper king which Alex again recorded. That ended our King fishing as Alex's ticket was fully punched. This year we non-residents are allowed just one fish a day, three for the season. 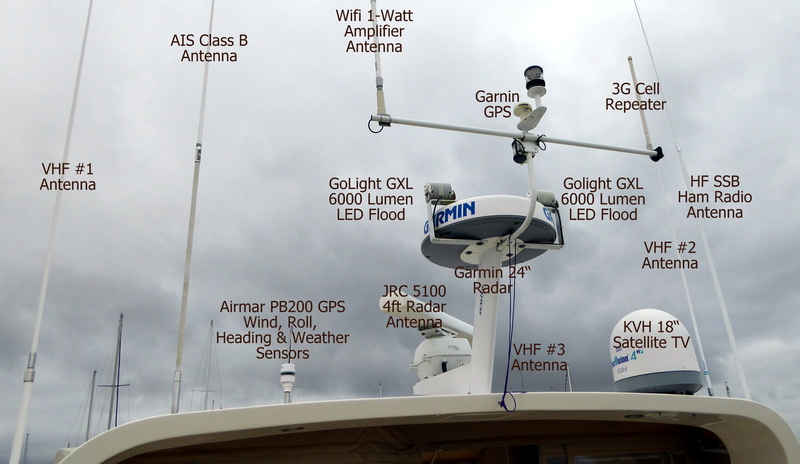 Jay's boat is configured nicely for trolling: easy access all around, new Cannon downriggers with digital controls, continuous drag adjusting reels, carbon fiber rods, half-tote ice container, Chirp sonar, and a quiet 4-stroke kicker. Jay's been fishing for years and Alex learned some new techniques for gear handling, fish de-hooking, and landing that maximizes trolling time. Miss Micky with Jay in control fishes extremely efficient and professional. Mis Micky's efficient layout allows easy access to gear. caught in Salisbury Sound, Southeast, Alaska. Sitka once again served up a pleasant stay. Next week the college fish boys join Alex on Wild Blue in San Francisco for some California salmon fishing. See you out there.